I've rarely met a margarita I didn't like. Throw in some guacamole and chips and I'm one happy diner. Serve these things in a garden that makes me feel as if I'm in San Diego and I'm hooked for life. No surprise, then, that Mojave is my kind of joint. 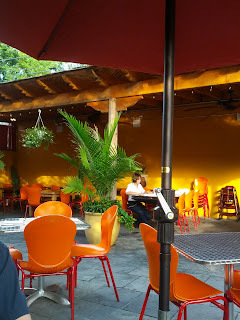 After a recent beach getaway, Dr. Science and I eased back into urban life with dinner at this Ditmars-area Southwestern/Mexican spot. 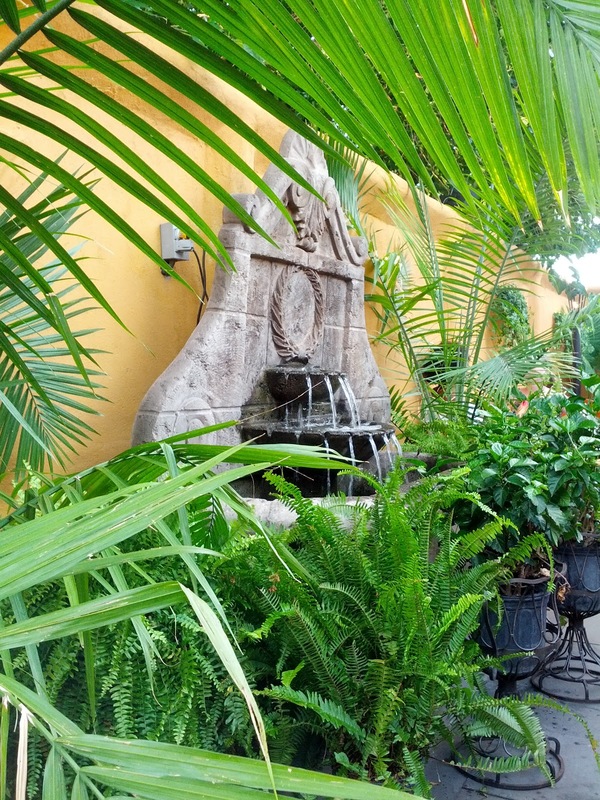 The back garden, with its yellow walls, small fountain, and abundant greenery, erased the memory of our schlep from the ocean to the railroad to the 7 to the N. Half a margarita later, all in Queens seemed right. 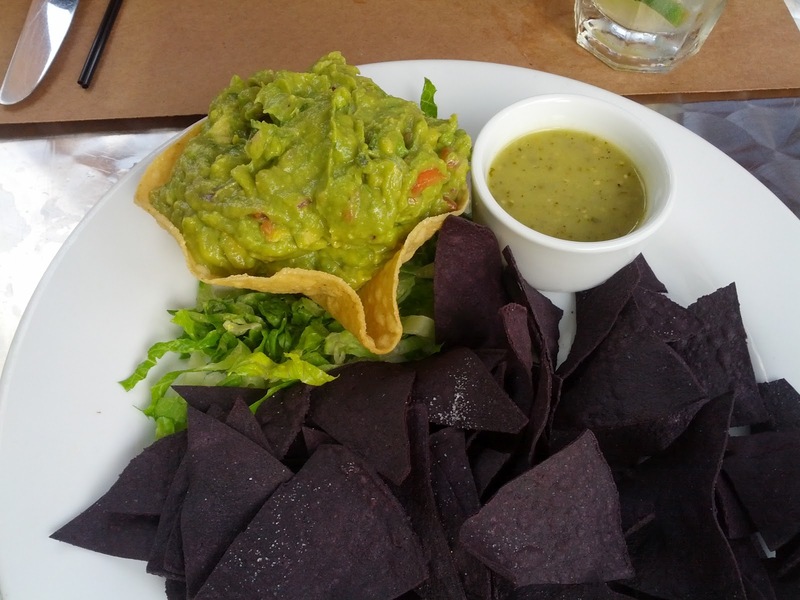 We started with the excellent guacamole – required eating for anyone who sets foot in the place. Good chips, too. 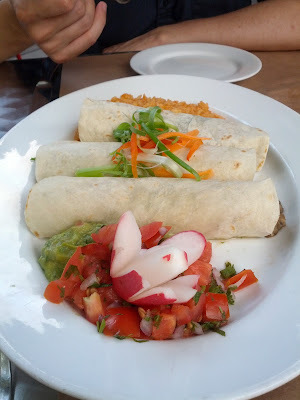 For part one of our entree, we shared the vegan tempeh and wild mushroom tacos. The local taco trucks have nothing to fear, but I appreciated the veganness. Tempeh doesn't turn up on too many menus in Astoria. 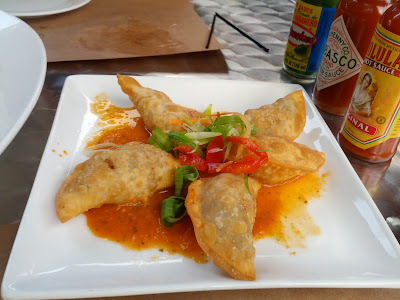 For part two, we split the plantain empanadas, which were slightly dry but enjoyable enough when dipped in the accompanying salsa. 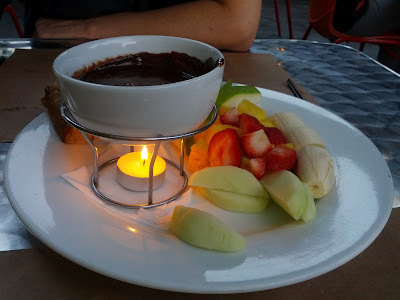 To cap things off, we ordered that classic Mexican dessert known as chocolate fondue. Authenticity be damned: you can't go wrong with fruit, spice cake, and molten chocolate. The service was pleasant and attentive, and the tab – $63 including tax and tip – seemed reasonable. It wasn't the greatest meal ever, but the whole experience, from the delightful garden to the tequila haze (OK, maybe especially the tequila haze), made me a fan. If you're actually from San Diego or Arizona or Mexico itself, lower your expectations. But by all means, grab an outdoor table and start sipping a margarita before winter comes.